The name property is only useful if the search property is either file or globals. It is used to specify the name of the file or global variable to be tested. =: data specified by search property (when the test runs) must exactly match the data specified by the for property (when the test is defined). >: data specified by search property must be greater than the data specified by the for property. <: data specified by search property must be less than the data specified by the for property. >=: data specified by search property must be greater than or equal to the data specified by the for property. <=: data specified by search property must be less than or equal to the data specified by the for property. contains: data specified by search property include the data specified by the for property. Example 6 (above) shows how to use the process property to count the number of error messages so that the test will pass if there are no syntax or runtime errors. 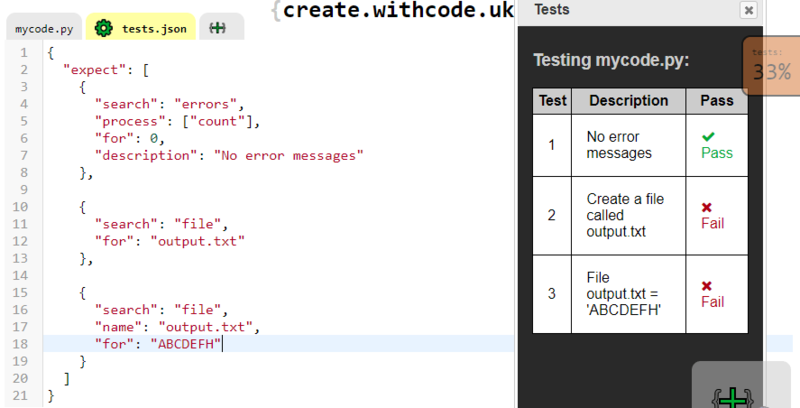 The description property lets you customise how each test is displayed in the test table. The test in Example 7 (above) behaves in exactly the same as example 6 but line 7 defines the text which describes that test in the testing table. Example 8 (above) defines three separate tests. Test 1 (lines 3-8) counts all of the error messages and checks if there are none of them. The next page is a reference guide for how to use the provide array in tests.json in order to provide input data to each test as it runs.